"The Club King 290 combines the acoustic richness of a full size semi-hollow with the clarity and bite of a 25-1/2" maple neck. The body is built from one slab of mahogany which is routed from the top, and then capped with a solid spruce top. Excellent sustain and attack are coupled with substantial resonance, for a thick tone that's suitable for blues, jazz and rock." I wonder if they do one with a Bigsby on it? Brazilian guitar pioneer da Silva dies: Horondino Jose da Silva, better known as "Dino Sete Cordas," or "Dino Seven Strings," for the instrument he pioneered, died Saturday in Rio de Janeiro. He was 88.
www.ItsOnlyRocknRoll.com: Ace Frehely's KISS era guitar up for grabs in charity auction; items from Jimi Hendrix, Led Zeppelin, The Who and others also available. Finnish monsters rock Eurovision: Lordi - a Finnish "horror rock" group who dress in monster costumes - have pulled off a surprise win at the 51st Eurovision Song Contest in Athens. I think it's a brilliant victory for rock music. What's the betting we'll see a lot more guitar bands in next year's contest? Award for 'pioneers' Led Zeppelin: The surviving members of Led Zeppelin have received an award recognising them as "great pioneers" of rock music. Def Leppard guitarist Vivian Campbell says "I hate metal music": Is he in the wrong job, I wonder? The Ovation Breadwinner Fanpage: here's a website about a guitar that I have secretly coveted for many years. I'd love to buy one, I just don't think I can justify doing so. Jim Reed Guitars - The Handle: an innovative new design in carbon fibre. I think it looks great, but then regular reader will already know how I love guitars with holes in the body! Read the press release on Modern Guitars. Attention vintage tube amp enthuiasts! 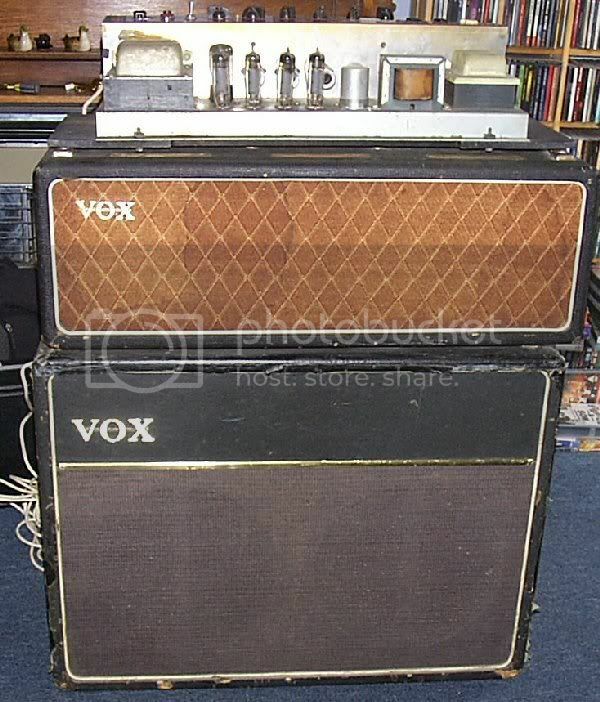 I'm selling my JMI-era VOX AC30 piggy-back amp and cab on eBay! Grab yourself a piece of history! Annihilator - Win the first Jeff Waters Signature Series guitar: You need to add him as a MySpace friend first, see www.myspace.com/annihilatorofficial. Langcaster Introduces The Ultimate-Lo Three-Pickup Strat Kitset: You too can upgrade your own Strat or Strat-style guitar in an easy and inexpensive way to a custom built boutique instrument. It's gotta be cheaper than buying a Langcaster guitar made of 35,000 year old wood! Michael Davis, MC5 bassist, injured in motorcycle accident: How rock'n'roll is that? Chris Isaak offers riffs about guitars: Chris Issak offers a quick buyer's guide for dummies. Which is nice of him. Ax Man: Randy Parsons is plugged into what rock stars like in their guitars: Jack White gets himself a custom built guitar courtesy of the man who is creating a line of "high-end electric guitars built from recycled car tires, newspapers, non-endangered woods and ceramics." Blimey! Scott French Introduces The SF3 Singlecut Progression Electric Guitar: a compact, lightweight electric guitar with a 12th fret body extension/strap button location for great balance. Scratch Pad Introduces Guitar Finish Protector: Scratch Pad is an attractive, non-adhesive finish protector which is easily applied, removed and re-applied to another instrument in seconds. Campbell American Guitars: They look quite tasty to me. I wish I'd paid more attention at the London Guitar Show this weekend, because somehow I missed these beauties. Bill Nelson and the Campbell Transitone at the London Guitar Show, 6th May 2006: Bill Nelson and the prototype guitar he designed. S'cuse Me While I Kiss Goodbye...: Hendrix film is doomed. Go-Betweens frontman dies in sleep: Grant McLennan, one of Australia's most acclaimed singer-songwriters, has died in his sleep, aged 48. While a guitar owner not-so-gently weeps: "Oh, my Lord, she's backed over my guitar." Godlyke Introduces The Deity 10-String Bass Guitar: Featuring a light-gauge 5-string arrangement (tuned B to G) with matching octave strings, the Deity-10 offers an extended frequency range not found on other instruments. No brain surgery for Stones star: Rolling Stones guitarist Keith Richards does not need brain surgery after suffering a head injury. Ex Mike Oldfield and Marc Bolan Telecaster on eBay! "This guitar is the original 1967 Fender Telecaster used by Mike Oldfield and was the only electric guitar sound source on his breakthrough Tubular Bells debut LP. 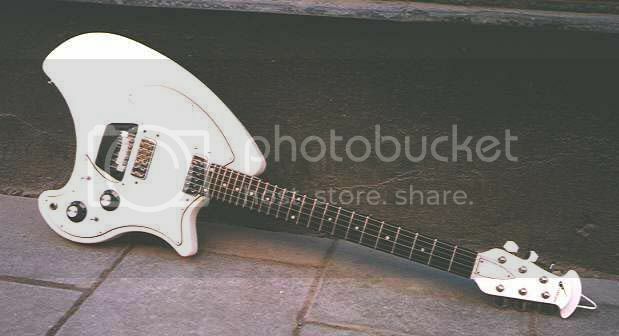 The guitar was formerly owned by Marc Bolan, it was originally white, has had refins and was then stripped to natural. The middle pickup is a Bill Lawrence, routed and fitted by Mike Oldfield and his father in their garden shed." UPDATE: The auction ended at £7,501.00 - Reserve not met (i.e. unsold). I wonder what the reserve was? I'm guessing it was in the region of £10,000. Adrian Belew interview: I was rather alarmed to hear he'd supposedly played on a Mariah Carey record - turns out it was a sample. Rolling Stones Guitarist Recovering: So, he was picking coconuts, eh? A likely story. Pupils 'choose to pick up guitar': In the UK, the guitar has become the most popular musical instrument to learn for children aged between eight and 11, an education department survey suggests. Guitar Wizard: "YOU CAN PLAY THE GUITAR IN A DAY THE NEW WAY!" Blah, blah, blah, etc. I saw this just now on a shopping channel on Cable TV and thought it was pretty funny. It's basically a guitar method for people who can't be arsed to learn how to play. OK, for people with hand disabilities, it's fair enough, but for everyone else, it's a bit of a cheat, isn't it?